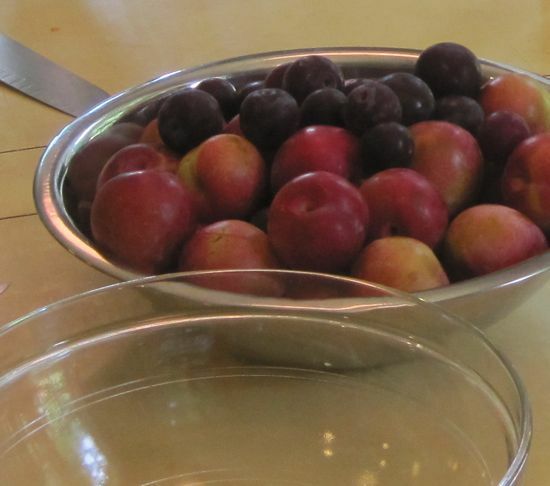 It’s the height of plum season and the markets are overflowing with plums in dark purple, pale yellow, ruby red. The variety is amazing – some have yellow flesh, others are bright red. I love how plums, when made into jam, or chutney, or this delectable Asian style sauce, glisten like rubies. I use this sauce as a dipping sauce for fried wontons stuffed with sauteed shitake mushrooms, ginger & garlic. But mostly I use this sauce for grilling – pork, chicken or tofu marry perfectly with the zippy fruity tang. 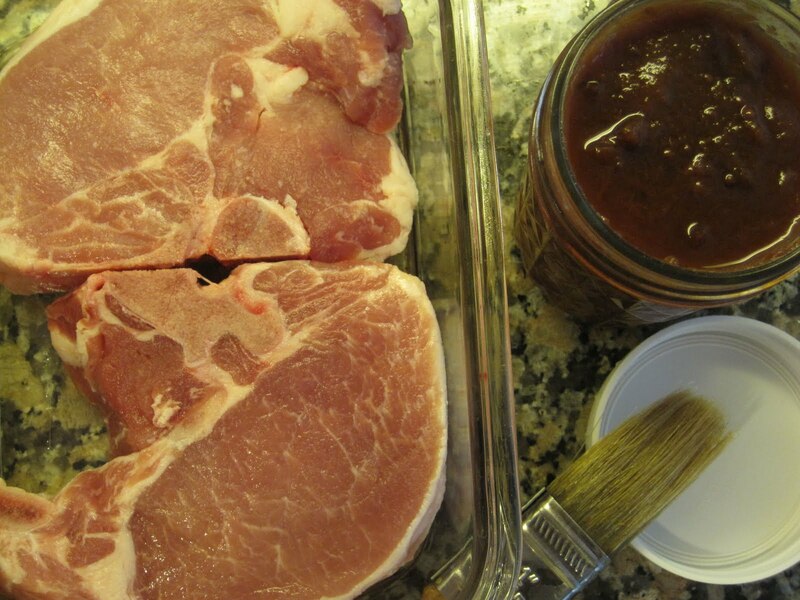 Recently, I didn’t have a tenderloin, but I did have two beautiful pork chops, so I treated them the same way. On a very hot grill, quick sear the chops on each side, then move them off the direct heat to finish the cooking indirectly, basting with the plum sauce from time to time. My chops were pretty thick and took 16 minutes on the grill, total, and then rested for 10 minutes before serving with warm plum sauce. Bring all ingredients except plums to a boil in a non-reactive pan. Stir in chopped plums. 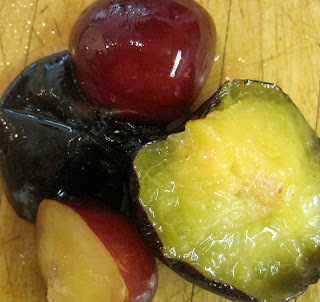 Reduce heat and simmer until thick, stirring often – about 30-45 minutes, depending on the moisture content of the plums. The mixture should be reduced by half. Puree in a blender, or use an immersion blender, or even mash with a potato masher – the sauce can be smooth or chunky. I prefer pieces of plum, so use my immersion blender. Fill hot half-pint jars with hot sauce, leaving 1/4″ headspace. I know I've just got to try this one…it looks amazing! Looks delicious and nothing I like better than seeing a bustling kitchen scene! Lucky me got a sneak preview, made a batch and have it tucked away in the pantry. I spooned some over a pork tenderloin before roasting it – fabulous! I was just about to put out a tweet asking how I should use up excess plums! Can't wait to try this, thanks. Great post, as always, Cathy. And, I love Punk Domestics, Sean! Thanks for all the nice comments! Lu – I was a little embarrassed to show that messy kitchen, but decided to put it out there. Kate – what kismet, hm? I first made this because I fell in love with too many plums at the farmers market.Sean – I'd LOVE to submit to punkdomestic.com – will do. Hi, Maria – when are we canning via Skype? Cathy, I made a batch of this sauce today and it is delicious. Sadly I only got 4 half pints so am going to make another batch tomorrow. I used 3 jalapenos from my garden and it's pretty spicy. Marilyn – I've had varying amounts from this recipe – from 4 to 6 half-pints. I think it has to do with the wateriness of the plums. Italian prune plums are the most dependable, in terms of providing 6 half-pints, as they are rather dense. This looks delish! I love that you canned it as well. I am getting ready to host a "Canning Week Blog Party" next week on my blog and hope you will stop by. We will be posting lots of tips, recipes,give-a-ways, and a linky party (which this post would be ideal for). 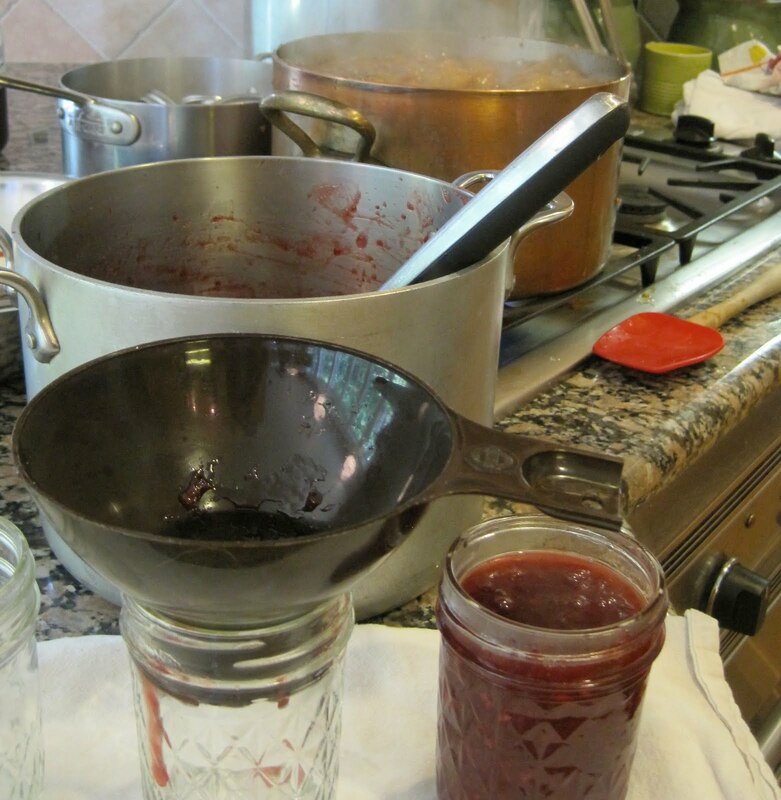 It should be a lot of fun and hopefully encourage and educate others about canning. Can you make Banana Jam? was getting ready to post that i’ve acquired plums for slivovitz and then i found your recipes for plum sauce (a regular, purchased item in my asiany pantry) and the chai spiced conserves. what’s a girl supposed to do? go back to the farmers’ market of course!